This pond netting is used as a physical barrier to prevent birds from landing in toxic tailing ponds or other water collection sites. The netting is stretched over these areas to prevent bird deaths. Installing pond netting will not only protect birds, but it also will prevent hefty fines associated with migratory bird deaths. 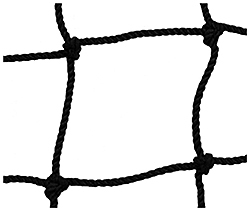 The netting is made from a durable, UV stabilized Dupont® knotted mesh nylon and meant for prolonged use in harsh environments.